I’m taking a brief detour from our adventure to share some more recent stories, but next post, we go to Greece. I may be starting to freak out. It was bound to happen. I’d say it was only a matter of time and that time has come. My birthday may have had something to do with it but mostly I think it was time. Yeah five months ago when we first came home, I bragged to friends about how for the first time in my life, I was plan-free, living life off track, post-corporate and proud. I am no longer okay with these things. And while I do have a plan now, it is evolving at a pace so slow it could kill me. I also bragged that one of the lessons I learned from our trip was that life has a pace of its own and you just have to go with the flow. Despite that revelation, I’ll probably die still trying to swim against it. When I went out for a girl’s night the week we got home, I actually told my friends that they were stressing me out. Seriously. In a voice reminiscent of the cast from “Dazed and Confused,” I told two of my closest girlfriends—amazing women who were juggling the complexities of work, husbands, kids, and life in general—that they were bumming me out. I was still reeling from my world awareness high and the issues of building a life in modern America seemed so unnecessary. I am working with a theory right now that suggests the dirty little secret of the life I grew up in is that things are so good, so comfortable, just so fine that we actually have to make up things to be upset about. Take a brief survey of your problems and assess which ones are actually self-inflicted, self-perpetuating and which ones are real. And even though I recognize that, I can help inflicting a little existential pain on myself. The oh-for-the-first-time-in-my-adult-life-I-don’t-have-a-plan-Molly got left behind when I could still joke with people that we were summering at my parents house in CT, rather than living with them because we don’t have jobs to support ourselves. Suburban squatting is what I call it now. I hope it’s self-deprecating enough to get a little laugh from people but not insulting to my parents who have been so supportive. They’re so generous that not only do they let us live in their house, eat their food, use their wifi, and drive their cars, they were also willing to star in my parody video of the whole experience. But it’s hard coming home, especially if you were the kid that was so independent she was never going to live at home. I created that narrative a long time ago, and I lived with it for all of my adult life, so you can understand how reshaping it has been a process. When I went down to the town hall in my hometown to re-register to vote, the women helping me with the form looked very confused about me. Finally it came out that she had a daughter that went to my high school that was about my age. I later figured that her daughter was probably in my older sister’s class. But at the time, I could not get out of there fast enough and agreed non-committally with everything that she said. But then came the ego-blow. “So moving back home are we?” she asked in that faux concern, thrilled at the prospect of some juicy gossip, sing-song tone. I murmured something about traveling the world for a year with my husband and looking for jobs so we could move back to New York City which is where we had been living for the past ten years and working successfully before we voluntarily took off to travel around the world. But the damage was done. I left and had a good, short cry in the car, drove home and fished my uninsured engagement ring out of the safe and wore it around for the next week to make myself feel better. A friend did get me a couple days of work as a fashion assistant. I was going to include those adventures here but I think I’ve got enough material for a separate post. And Nellu verified votes for the AP for three days so we do have a little money coming in. I’ve become a connoisseur of cat videos and Gangnam style tributes. (Apparently there was a recent cat video film festival and Henri 2, Paw de Deux won a well deserved award for top video.) I do this mostly under the guise of research. I want to be gainfully employed, writing and creating video for the web, news video really, but it’s important for me to know what’s out there, right? This is the same justification that led me to conclude I could sample the local brews abroad and call that research too. I actively look forward to “Mentalist” marathons and I try hard to suppress my disappointment when they air shows I’ve already seen. I may have go cold turkey on this addiction because after five months, I’m pretty much caught up. While I do spend most of my days in my worn yoga pants and fleece swag from my old job, I have an active policy stating that neither velour pants nor my fleece-lined Crocs should be worn out of the house. 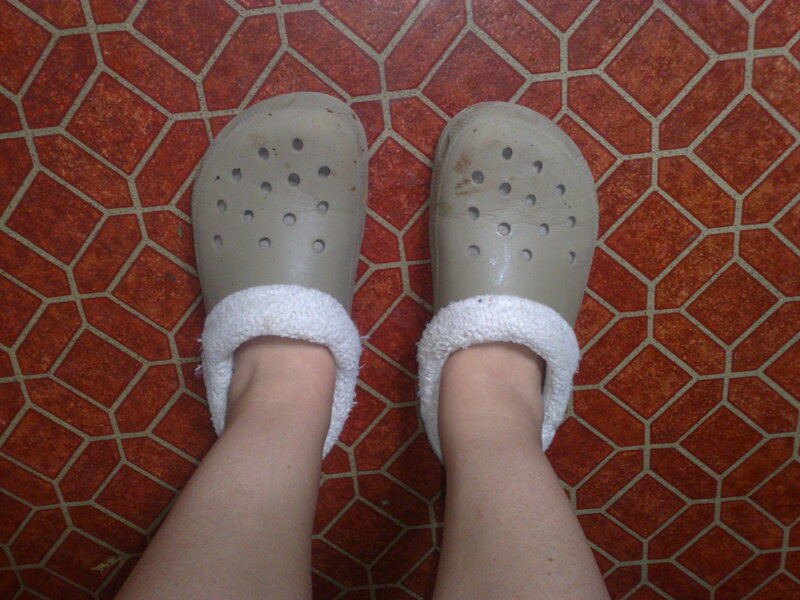 Although, on more than one occasion, you could catch me running errands in my Crocs. I used to call these my Connecticut shoes, but since I live here now, I just call them my shoes. And I’ve made progress on retraining my hair. This is just a nice way of saying that I go as long as I can without washing my hair so that I can wash it less often when I am gainfully employed, which I hope will be soon, real soon. I lived for a long-time in the world where my job dictated my large degree of my self-worth. Rewriting this story is hard. Change and transition are hard. But not as hard as not having food, running water, internal heat, access to education, opportunity, upward mobility or dealing with the persistent threat of violence, conflict or war on a daily basis. Shall I go on or should I just stop freaking out and be grateful that I have such a cushy place to squat? And after ignoring the friendly advice of others, I can tell you they are right. It’s similar to the feeling you have after riding a horse…but worse, much worse. (Nellu swears he bruised his tailbone.) Still, given the opportunity to ride a camel, you have to do it. 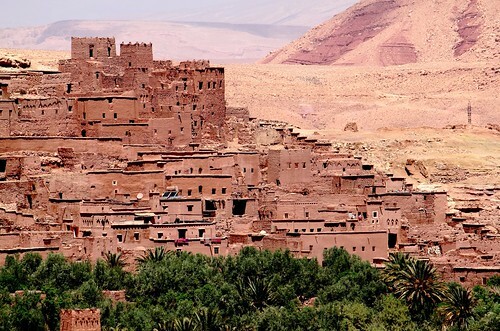 From Marrakech, Nellu and I took an overnight trip over the Atlas Mountains, through the city of Aït Benhaddou (a town that has been used as a backdrop for several famous films), and to the Sahara Desert. 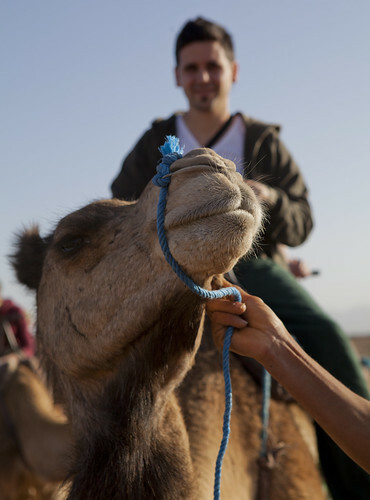 At the edge of the desert, we met our camels for a 45 minute ride out to the Berber camp where we spent the night. While the overnight was relatively uneventful, the highlight was definitely the journey, a journey which left a lingering impression on our bodies. 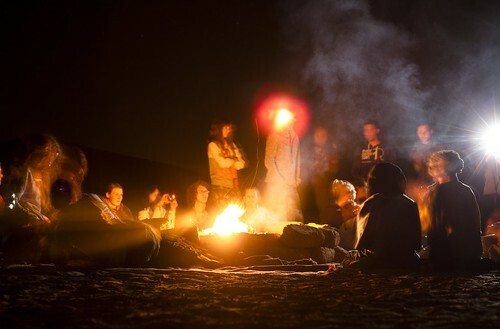 The Berbers made a fire for us in the Sahara Desert. Photo by Nellu.